Every clinical researcher understands the importance of saving time and resources during the conduct of clinical trials. This is especially true when you consider the collection, processing and management of protocol-specific data for each study subject. In the past, study coordinators relied on paper Case Report Forms (CRFs) to ensure the required patient data was recorded and transferred to the sponsor for processing and analysis. Thankfully the days of paper CRFs are largely behind us as the industry understands that the use of electronic data capture (EDC) systems increases the efficiency of data collection and improves overall data quality. In addition to increased speed and quality, EDC also provides faster data access, improved security and greater visibility while reducing costs and ensuring regulatory compliance. All EDC solutions are not created equal so selecting the right one is very important. Your EDC system should be flexible, highly-configurable, scalable, easy to use and, most importantly, compliant with all requisite regulatory requirements and industry standards. 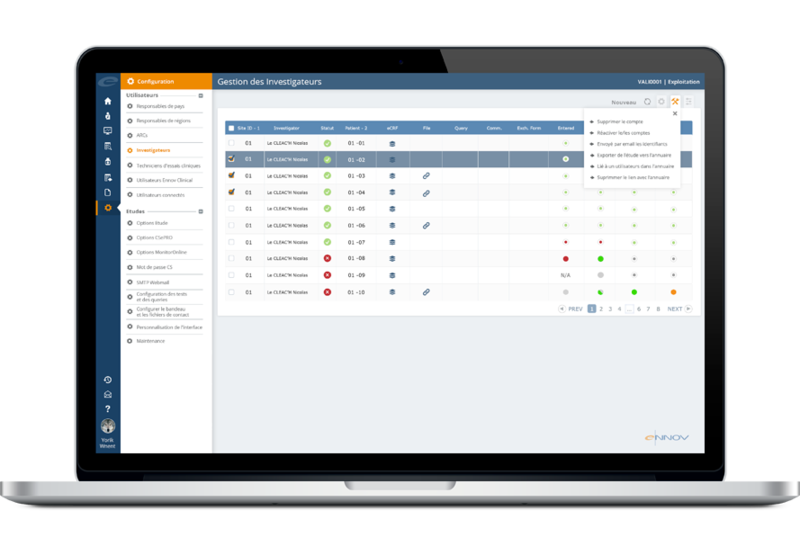 Ennov EDC is a comprehensive clinical data management solution that allows clinical research personnel to easily define EDC studies and collect subject data without the worry of missing or inaccurate data. Creating EDC studies is easy with Ennov EDC. Our graphical design tools take the complexity out of creating eCRFs. All standard field formats are supported and a wide array of validation rules and edit checks ensure that subject data is entered correctly the first time. Computed fields, calculated intervals and a configurable library of allowable values (harmonized with CDISC, CDASH and STDM standards) provide Ennov EDC with the flexibility required to support even the most sophisticated and complex study designs. In addition, Ennov EDC working in tandem with Ennov ePRO, patients can record their own diaries and quality of life assessments. Our intuitive EDC software significantly streamlines study design, consistency tests, medical coding (MedDRA, WHO Drug), data import and export.